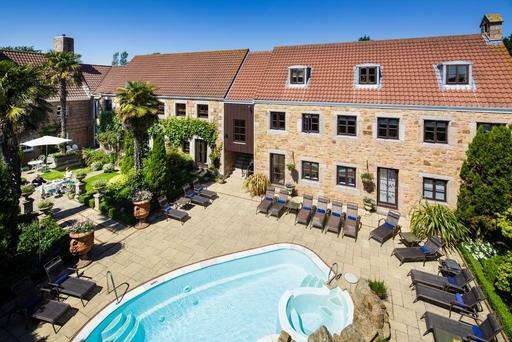 Located in the rural heart of Jersey, yet only ten minutes from St Helier and within easy striking distance of all the finest attractions, this 17th century country house is an oasis of tranquillity. Managers Joe and Carmelita have created an effortlessly relaxing and hospitable atmosphere where nothing is too much trouble. Bedrooms are decorated in English country manor style and all come with free Wi-Fi, flat screen satellite TVs, cotton linen, luxurious bathrobes, white duck down duvets and White Company toiletries. For an even more truly luxurious experience, ask about the upgraded room types. The food here is excellent and the one AA Rosette restaurant serves British cuisine with a Continental twist using Jersey’s finest local produce, including freshly caught scallops and Jersey Royals plucked from the ground. One of the great treats of Greenhills is looking out over the beautiful gardens or relaxing in one of the cosy lounges with afternoon tea. In the cooler months there are log fires and the bar is a great place for relaxing. Jersey is a small island, so all the sights and natural beauty are within easy reach, including shopping in St Helier and the stunning scenery of cliff walks and country lanes interspersed with many enticing country pubs, seaside cafes and restaurants. Guests of Greenhills are also invited to make free use of the Aquadome leisure centre in St Helier, including its indoor pool, gym, sauna and steam room as well the Flowrider surf machine.